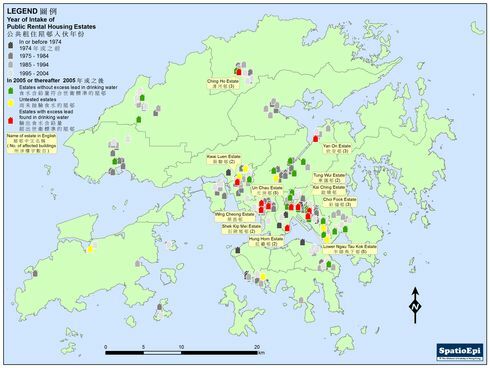 In response to the excess lead content found in drinking water in some recently established public rental housing (PRH) estates in early July 2015, the Government of Hong Kong decided to conduct testing on drinking water samples taken from all PRH estates. The first phase of water sampling tests in PRH estates built in 2005 and thereafter, was completed by the end of September 2015. The map shows the distribution of a total of 11 PRH estates, which were found to contain excess lead in drinking water. The subsequent phase of water testing was extended to those PRH estates completed before 2005. As of 4th November, none of these estates showed excess lead in drinking water. The use of leaded solder materials was found to be the main cause of this incident. While water pipes were generally connected mechanically, without soldering, for those PRH estates completed before 2005, the chance for finding excess lead content in drinking water again would be limited. 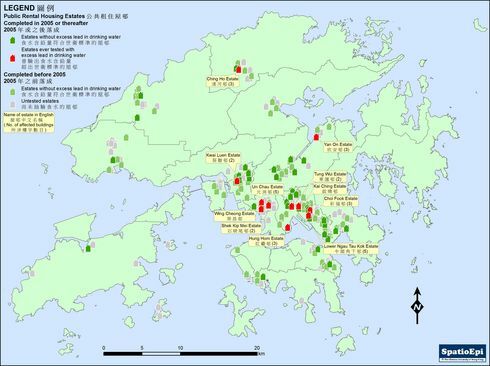 Data for the map were obtained from Hong Kong Housing Authority and Information Services Department, Hong Kong. Lead is a naturally occurring heavy metal, which is usually present in tiny quantity in the environment. However, lead and its compounds could be more commonly found in industrial products, such as paints, batteries, ceramics, solder and leaded petrol. Non-occupational exposure sources to lead, usually at a very low level, include urban dust, contaminated food and water. Large amounts of lead accumulated in the body, due to long term exposure, may result in anaemia, high blood pressure, brain and kidney damage. 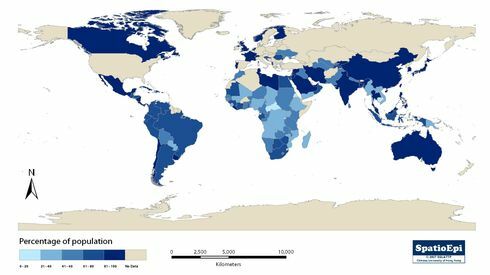 Infants, young children under six, pregnant women and lactating women were more susceptible to the adverse effects caused by elevated blood lead level. Health advice shall be sought if whole blood lead level exceeds 10 microgram/decilitre for adults or 5 microgram/decilitre for persons under 18, pregnant or lactating women.